The second card crosses the first in order to symbolize an obstacle that prevents the Querant from acting positively. The positions can change in order to match your needs. 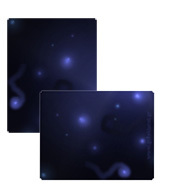 For example, the card in position 3 can answer questions like “What is my great fear?” or “Who can support me?”. In position 1, many readers choose to place the Significator card who stands for the Querant. I rarely do that. I prefer to randomly choose a card so that I can get more information about the Querant's current condition. Choose the method that suits you best. Question: Some years ago, I set up my own small business. I invested all my money, time and effort in this business and everything ran smoothly for some time. But, during the past six months, things seem to take a turn for the worse. I have lost many clients, I can't afford to pay my workers and no matter how hard I try, I'm afraid that we'll have to shut it down soon. What are the perspectives? How can I get my business to flourish again? 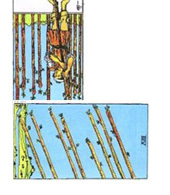 The Nine of Wands which appears reversed in the first position indicates that you are tired of fighting lost causes. The man on the card is wearing a blood-stained headband, implying that he has gone through many battles. You need to recover your strength and courage. You also need to incorporate novelty in your business. Think about changing your marketing methods or making any necessary changes in the way you run your business, staying away from old ruts. You may be lacking flexibility and initiative. The Eight of Wands reversed in the second position indicates that postponements, cancellations and delays pin you down. What is more, your surroundings are inconstant so you can't get the whole picture. You need to wait. Information cannot be trusted at this time. Later, things will clear up so you'll be able o make the right decisions. Plan now, implement later. Even though the Ace of Wands is a very creative, energetic card, it appeared reversed in this reading which shows that your poor business planning is yet another reason for your troubles. You tend to make decisions hastily, without much thought. You need to have a clear idea of your capabilities, without overestimating your powers. It's better to build something smaller, and more secure. Abandon bigger-than-life projects at this time and try to re-estimate your goals. The Page of Swords in position 5 could indicate a young person, perhaps one of your colleagues or workers, who has already proven useful thanks to his ideas or information. It might be a good idea to turn to him again. This card can also imply that you need to keep a keen eye on what's going on at the market and negotiate in a smart, diplomatic way. Your communication skills have already helped you much. Don't ignore them now. The High Priestess in the fourth position, indicating a major influence, is the card of knowledge. Make sure you have all the information you need before making decisions and also invest some money and energy in business seminars and additional education. The High Priestess also encourages you to think of your business as your own personal stamp in the business worlds. How would you like it to be? What would be its special features? Find out what your really want your business to be about and don't hesitate to follow your intuition, even when the others think otherwise. The Seven of Swords, the infamous “thief's card” appeared in the sixth position. This serves as a warning: you need to be extra careful during the following period because there may be attempts to deceive or mislead you. There is an unknown enemy who works in the hide. Be cautious. What is more, be ware of ill-intentioned gossip that could harm you or your business. The Four of Pentacles in the position which symbolizes what really motivates you, shows that you are inspired by material security. This is something positive, but make sure you don't over-attach yourself to money or other material assets. Avarice and miserliness cannot be your guide. Make sure you share your profits. The Three of Cups stands for the people in your environment. A very positive card, it shows that you can trust your family, circle of colleagues and friends. Brothers or sisters can also be very supportive. Accept invitations and don't hesitate to socialise a bit more. You may find a useful partner in your social encounters. Your inner feelings are represented by the Eight of Cups reversed. This shows that you sometimes feel like abandoning everything in order to start a new life, somewhere else. But this would only be irresponsible at this time. Sudden, disruptive change is not favored at this time. If you're really fed up with problems, make sure you accept responsibility towards your employees and family before you make your final decisions, or you will soon find yourself in a much worse situation. Finally, the Sun appears reversed in the final position which indicates the final outcome. This is one of the most positive cards of the Major Arcana. The Sun shows you will be successful in overcoming obstacles and adversities, especially if you follow the advice provided by the previous cards. The results may not come fast and some extra effort may be necessary on your part, but you need to trust that things will take a turn for the better!